First cut a 6" x 9 1/2" piece of brown card stock and fold it in half for the base, a 4 1/2" x 5 3/4" piece of black for the middle layer, a 4 1/4" x 5 1/2" piece of newsprint card stock for the front layer and a 5 1/2" punched brown strip. Then dry emboss the newsprint card stock with a Stampin' Up! Honeycomb embossing folder, sponge the edges with Stazon Jet Black ink then attach it to the middle layer. Next punch the lace strip with a Stampin' Up! 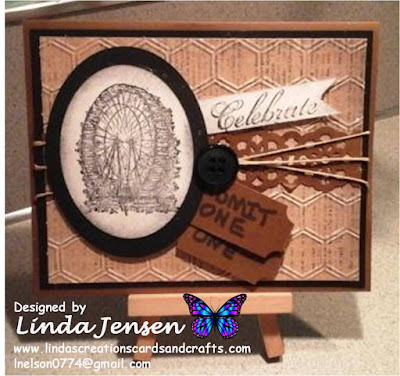 Large Border Lace punch, attach it to the front layer, then tie Stampin' Up! Hemp Twine around both layers. Next cut two ticket size pieces of brown card stock, punch the corners with a Stampin' Up! Ticket Corner punch and attach them to the front with mini pop dots. Then cut out the white banner with a Stampin' Up! Bitty Banners Framelits die, sponge the edges and stamp the sentiment in Jet Black ink, then attach it to the front with mini pop dots. Next cut out ovals for the ferris wheel and it's background using Spellbinders Classic Oval dies. Then sponge the white oval's edges and stamp the ferris wheel in Jet Black ink, then attach the white oval to the black one then the black one to the front. Finally add a black button, attach the middle layer to the base and enjoy!